Pine View Enterprises, Inc. exists to create value for its customers by providing quality bedding products and an efficient, cost-effective manure removal service. We have been serving farms in Lancaster County, Pennsylvania and areas beyond for more than 20 years. The products we offer for sale are wood-based animal bedding such as sawdust, pine shavings, kiln dried sawdust, and bedding pellets for large and small customers alike. Our unique delivery system allows for us to deliver bedding and provide manure removal service in one efficient trip to save money. We boast a strong supply chain of woodworking mills and bedding manufacturers to supply our bedding customers all year long. We have been innovators in converting manure to compost and organic fertilizer in the Chesapeake Bay region for the past 12 years. Annually, our composting of manure keeps approximately 20,000 tons of raw manure from being land applied and reaching the waters of the Chesapeake Bay. We believe our system is one solution to keep animal management and livestock production viable for years to come. 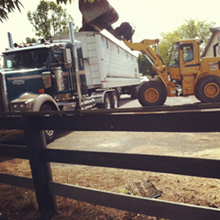 We operate a fleet of 6 roll-off trucks to deliver bedding and remove manure for a variety of horse operations. We also have 6 tractors and 15 walking floor trailers that service large, commercial operations with bedding and manure removal services. 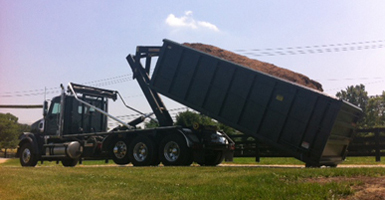 We are certified manure haulers and brokers with the Pennsylvania Department of Agriculture. Call us today at 717-529-2855 to see how we might help you! How often would a pick-up need to be scheduled, and how much would it cost? We work closely with you to determine your needs. © Copyright 2013 Pine View Enterprises, Inc. Web Design Lancaster PA.